The ‘day before Halloween’ [aka October 30] is better known as ‘the professor’s birthday’ chez nous. 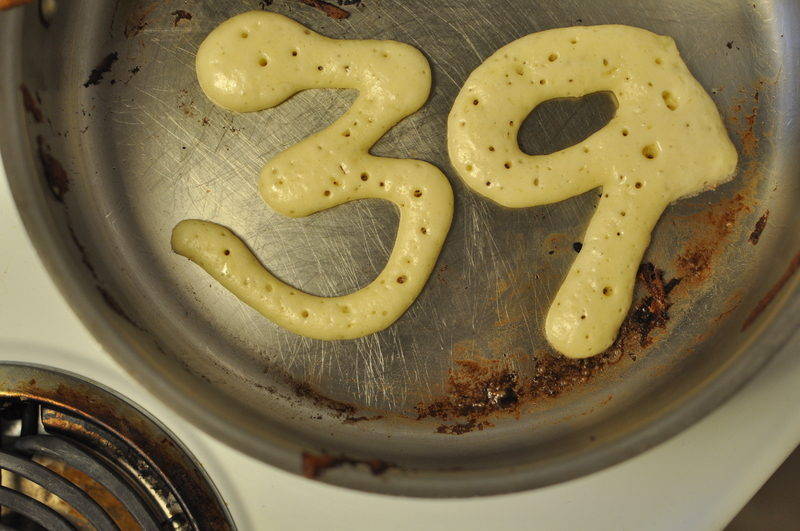 So on Tuesday, just before 7am, the Hen and I tiptoed out to the kitchen so he could begin the making-of-the-cards and I could commence the making-of-the-pancakes. Which is [almost always] the professor’s job. I steered clear of our go-to recipe. And attempted to recreate a double batch of Donna Hay’s hotcakes with cinnamon butter instead. The Hen and the Gort were working on their ‘monster’ birthday cards and I was quietly grating lemon zest, thinking about the lovely morning we were having, when I sensed a chunk of my thumbnail had departed from said thumb. My quiet morning was rudely interrupted by a loud yelp emanating from my own mouth. There in the middle of my Microplane grater was the missing piece of blue-nailpolished-nail thoroughly lodged into its tiny metal grooves. And that’s how I knew the day was going to be awful. Despite the fact that it was the professor’s 39th birthday and likely warranted a bit of celebration, the day was dedicated to completing those tasks we’d been putting off for month(s) and year(s): namely the acquisition of Alberta drivers’ licenses and saying a final farewell to our over-insured and under-functioning car-van. So around 10am, we headed to the Registry for the drivers’ licenses. This was a potentially bad decision because the Hen needed to be picked up at 10.50am and anyone who’s ever had the privilege of interacting with driver’s license issuers knows that it’s not generally a speedy process. As luck would have it, there was also a line. A small, 4-people-in-front-of-us-line, but a line nonetheless. So we stood and waited and I glanced periodically at my cell phone to see what time it was. Finally it was our turn, and we lunged toward the counter, fully aware that we had gotten the slowest of the three employees; the one who’d managed to help one man while the other employees had assisted two customers each. It did not bode well for our mission to get out of there by 10.45am. We handed her our passports and work permits and bank statements and our Indiana Drivers Licenses. As she reviewed the documents, she stipulated: ‘you’re aware that you won’t be getting your US Licenses back today.’ And the professor said ‘yes’ and I said ‘no? !’ and demanded to know why, since I was not emotionally prepared to surrender the little plastic card with my picture on it, the one I look at every time I open my wallet. ‘Because we send it to customs,’ she replied, ‘and you’re not allowed to have two drivers’ licenses.’ And I said nothing, but it begged the question – why are we allowed to keep expired/invalid passports but not drivers’ licenses? ‘I can make you a photo copy,’ she offered, since it was obvious I had some bizarre attachment to the license I’d had since I was 17. And I said sure, though I’m not sure why – what was I going to do with a photocopied image of a driver’s license? After taking my ‘unlikely to be as good’ Alberta driver’s license picture, Percy and I sped off to pick up the Hen. Minutes later, we returned to the Registry to pick up the professor and then we drove to the nearby Superstore to get candy for the inevitable onslaught of trick or treaters. We procured candy and a trio of orange pumpkins to carve on the boys’ behalf, and we returned home to tend to the next errand on the list: namely, dumping the van. We unloaded the pumpkins and the candy. The professor grabbed the van keys and……the van refused to start. The professor decided to get a head-start on the pumpkin carving while we waited for the battery to charge. He cut the top off the Hen’s pumpkin and, one second later, made his infamous dry-heaving, faux-vomiting sound, ‘you’re taking care of this,’ he insisted, thrusting the orange pumpkin towards me. But I’m no fool – obviously he’d seen something dis-gus-ting inside that pumpkin and I wasn’t about to deal with it. 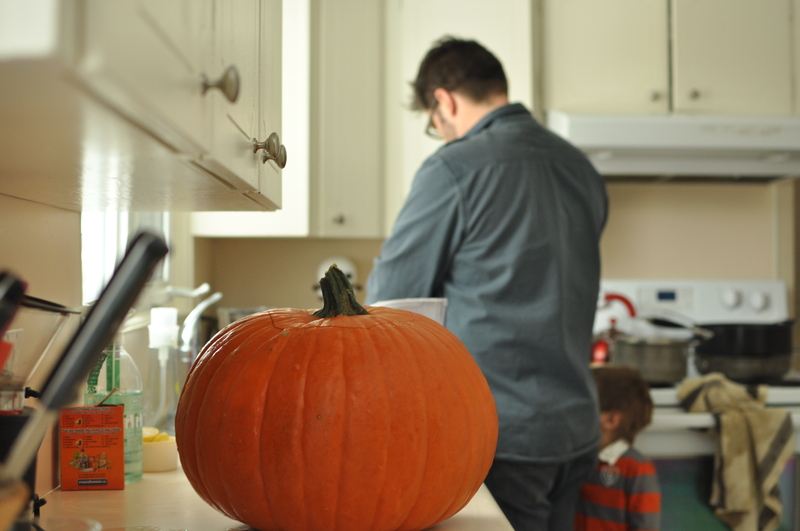 So he hustled to the kitchen with the pumpkin and dumped out ‘whatever’ was inside the gourd. ‘I’m hungry’, the Hen suddenly remembered. ‘Well, why don’t you eat some of the pancakes and cinnamon butter,’ I suggested – pointing to the morning’s leftovers. ‘They’re dry and I don’t like pancakes that are dry,’ the critic declined. Of course, I hadn’t really tried the glutenous hotcakes, but suddenly I understood why my pancake-loving husband had sounded so insincere when he’d thanked me after breakfast. We were finally ready to leave on this, our final overdue errand, except now we were cutting it close to pick the Gort up from school on time. But we couldn’t count on the van’s battery to stay charged, so we went. Our streak-of-awesomeness continued and we got lost not once, not twice, but three times. A lady. We kept driving past the iconic yellow car-on-a-perch that marks the Pick-n-Pull, yet we couldn’t seem to find the entrance. ‘Look kids, Big Ben,’ kept running through my head as I followed the car-van to nowhere. Finally we found the hidden entrance and the professor went inside the office to fill out paperwork. He was gone for a long time. ‘What are you doing?’ I texted him. ‘Canadians type slow’ he replied. We raced back to the school, five minutes late; luckily I’d texted-begged my neighbor to keep an eye on the Gort until we got there. Since we were a few blocks away from the bank, we stopped there to deposit a cheque. I had to be gone for a few hours and it occurred to me I’d left the professor at home with the boys and nothing to make for dinner. So I picked up a pizza from Panago on my way home. ‘Bringing a pozza,’ I informed him, in the off-chance he was trying to make a dinner out of nothing. Around the same time I walked through the door with my ‘pozza’, the professor left the kitchen and closed a door. The bathroom door, I assumed, but when several minutes had passed and he had not yet emerged, I decided to investigate. The bathroom door was wide open, the bedroom door was closed. About an hour later, as we were doing our best to herd the boy-cats to their respective bedrooms with disregarded pleas-threats like ‘put on your pajamas,’ ‘brush your teeth,’ and ‘get into bed!’, there was crying. The injured kind of crying. Blood-in-the-mouth-because-it-hit the-enormous-bed-post kind of crying. I braced myself to look inside Percy’s mouth, trying to figure out if he’d lost his teeth, or if they’d simply been shoved further into his gums. It appeared to be the latter. So the professor went to Shopper’s Drug for popsicles and children’s Anbesol and Ibuprofen while I tried to placate the bleeding three year old. 62 was as sad as 39, Herr Johnson. P.S. Loved the car-van with the Indiana plate. Sniff. Yes, I think its placement beside the garbage truck is particularly fitting.